North Cyprus General Information North Cyprus is a small country, and its full official title is the Turkish Republic of Northern Cyprus.The country itself measures approximately 120 miles wide and is only 15 miles across from the border with south Cyprus to the north coast. So, it's easy to explore North Cyprus when you rent a car here, as nowhere is every far away by European standards! The island of Cyprus is located in the eastern Mediterranean Sea and since the earliest of times has been a central meeting point for all sea traders.The Turkish Cypriots are able to trace their history right back to invaders,rulers and trading partners that include the ancient Assyrians, Romans, Persians, and Byzantines.Evidence of these civilizations can also been seen throughout the landscape of North Cyprus, and with a hire car from Pacific Rent A Car,you can explore from the Persian palace at Vuoni in the west to the Roman ruins of Salamis in the east. North Cyprus is a rapidly growing holiday destination.The country is unlike its southern neighbour in that there are no huge tourist development sites. North Cyprus has some amazing beaches and is full of ancient sites that you can visit.These features alone make North Cyprus the ideal holiday destination for those who wish to relax and enjoy a sun soaked holiday.There are a number of excellent modern hotels but in order to get the best deals you do need to book early. North Cyprus can has in total 12,000 beds available for tourist accommodation and during the summer months these fill up very quickly. There are two mobile phone operators in North Cyprus so calling home is not a problem and when you do you will have so much to report.There is the amazing scenery, excellent beaches, water sports, sumptuous food, nightlife, and much more. North Cyprus comes alive at night and a perfect way to enjoy your evening is by taking a stroll along Kyrenia harbour.Here you can enjoy traditional food, dance at open air beach parties and nightclubs, or just relax at a cafe; and watch everyone pass by.There really is something for everyone and that is what makes North Cyprus the perfect place to visit. 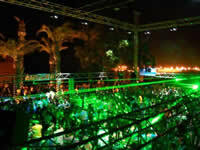 Many resort hotels also have superb nightclubs, and some, such as the Acapulco Resort, attract international DJs to their open-air venues. It's easy to reach these nightclubs if you hire a car from Pacific Rent A Car, but remember, the drink/drive laws in North Cyprus are strictly enforced, so if you do want to drink, take a taxi instead. There are two mobile phone operators in North Cyprus, so calling home is not a problem (and when you do you will have so much to talk about!). In the highly unlikely event that your hire car breaks down (particularly unlikely with one of our new cars from the Pacific car rental fleet), use you mobile to call our 24/7 rescue service. The North Cyprus economy is mostly made up of agriculture or government service but it is growing at a rapid rate.The Turkish Cypriot people are full of enthusiasm and drive, but their struggle for international recognition still limits the amount of foreign investment that is brought into the country.However, this situation does help to keep North Cyprus unique! The official language spoken in North Cyprus is Turkish and learning just a few phrases can really help when it comes to your holiday. This is not necessary however as the majority of people here will also speak English. All the Pacific Rent A Car staff speak English, for example. 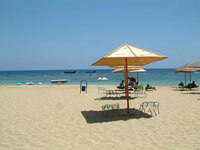 There are so many wonderful sights to see when you holiday in North Cyprus that getting them all will be difficult. Ask any Turkish Cypriot what you should see and they will be able to list off a wide range including the North Nicosia’s Venetian Walls, the harbour town of Kyrenia, and much more. If you like kebabs you can find the best ones near the Selimiye Mosque. 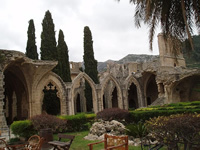 For casinos there is Kyrenia which also has its own Venetian castle. There are the lemon groves at Bellapais, and the most famous resort of all Famagusta. There really is something for everyone and even outdoor enthusiasts can enjoy North Cyprus and include a trek through the Five Finger Mountains in their holiday. Our top 'insider tip': for cheap car rental in North Cyprus, choose Pacific Rent A Car!